1. Preheat a griddle pan or barbecue over a high heat. 2. Brush the bread with oil and cook for 1-2 minutes each side. 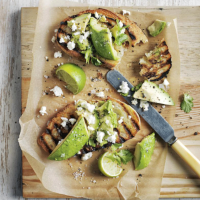 Smash the avocado onto the toasted bread, and top with the feta and coriander leaves, and squeeze over the lime wedges. 3. Sprinkle with salt and pepper, and serve.